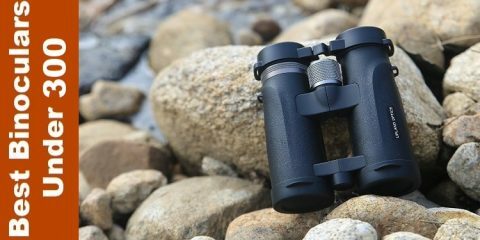 Best Binoculars Under 300 Dollars: A Loud Bang for Your Buck! With your natural hair, you’re trying to avoid chemicals and styling that destroys your hair. You will need high temperatures to straighten, but it needs to be nourishing to your hair. That can be difficult to find in a normal flat iron. The flat irons that include steam are the answer to your prayers. They lock in moisture while giving you flowing, beautiful hair. Regular flat irons use the hair’s own moisture for straightening. This can leach the moisture right out of your hair. Steam flat irons will deliver moisture to your hair. It’ll look better after you’re done applying heat versus before. You want healthier hair after styling – not dead, brittle hair. These steam flat irons are the best flat irons for natural hair. They moisturize and nurture your hair to a healthy shine. How is a Steam Flat Iron Different from a Regular Flat Iron? A regular flat iron has metal plates that are heated. Those heated plates are pressed around the hair and pulled downward. That heat and the plate material removes frizz, curl, and waves from hair. The heated plates from a regular flat iron are all some people need for straight hair. It depends on their hair structure and curl type. There are many hair types that are resistant to a regular flat iron, though. That’s where the steam flat iron comes into play. It’s for hair that is truly hard to straighten. Natural hair that hasn’t had any added chemicals is hair that needs an extra boost to become bone straight. Instead of chemicals, natural hair relies on heat and time to remove the natural curl. A steam flat iron infuses the hair with moisture, so it’s straightening without removing natural oils and moisture. A regular flat iron uses the hair’s own moisture to straighten. That can lead to dry hair. That won’t happen with a steam iron. This steam flat iron straightens natural hair easily. It has a 10ml water tank. It’s a simple process to remove the tank and fill it with water. There are instructions and a bottle for filling. There are 3 levels of steam for this flat iron. Some steam straighteners have one option. This one allows you to switch between medium and high steam. Quick touchups can be achieved with the medium setting easily. There’s also a no steam option, which makes the steam flat iron a regular flat iron. As far as heat, the flat iron has a 15-second quick heat option. It’ll go to 300 degrees F in that 15 seconds. There are a variety of heat settings. 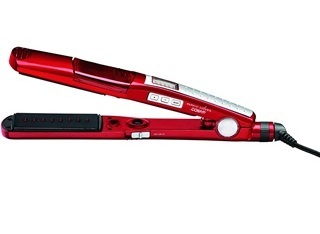 It ranges from 300 degrees F to 450 F, which is the hottest of any flat iron. The lowest setting is for thin hair. At 340 F to 370 F, you’re getting a temp great for normal hair. 410 F to 430 F is for slightly curly hair. It’s good for natural hair, too. The highest temp is 450 F, and that’s perfect for most women with natural hair. What I love about this product? The steam flat iron comes with safety features like an automatic shutoff. It also comes with gloves, so you won’t burn your hands. There’s also a swivel cord that makes it easy to move as you work. All of these are very thoughtful additions. They will make it easier to use the steam iron. 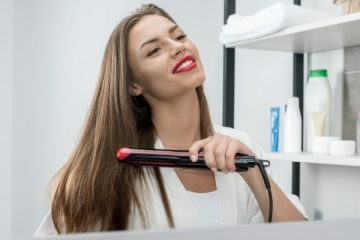 It’s especially good for those who have never used a steam flat iron before. The high temp options are great for women with natural hair. Even with the steam, some women have hair that’s resistant to straightening. Tank has to be filled a few times for longer hair. 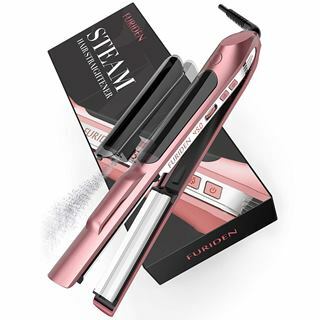 The steam straightener from OSIR has a titanium plate fused with ceramic. It has the ability to heat up in a quick 30 seconds. It combines a titanium smoothness with the moisturizing steam. The plates won’t tug or pull on your hair. Another reason it won’t tug your hair is because of the no-gap design. The plates will meet very close to the hair. You won’t end up with gaps that won’t straighten some sections. The no-gap design helps to reduce heat damage because you won’t have to repeatedly go over parts of your hair. The steam straightener reaches a temp of 450 degrees F. That’s as high as most flat irons will go. It’s the right temperature for natural hair that can be resistant to straightening. In this steam flat iron, you’re getting a styler that performs automatically. Steam will work on your hair as you pull it through. You don’t have to press any extra buttons. The automatic spray will infuse your hair with moisture since you can use water or oil. Extras in this steam flat iron are some of the best features. For example, the automatic spraying makes styling faster and easier. There’s a rubber grip at the end for holding while styling, too. It’ll keep your fingers from getting burned. The no-gap design is a feature that every steam iron should have. Floating plates and no-gap designs are made to evenly heat the plates and your hair. It creates a sleeker style in your hair without repeated passes. The swivel cord moves 360 degrees, so you can move as you style. You can also flip it from one side of your hair to the other with ease. The swivel design will follow your hand movements as you style. Water tank has to be filled a few times for longer hair. The Magicfly steam iron will work well on natural hair. Especially if it’s normally resistant to your straightening efforts. It reaches the high temperatures that you’ll need for bone straight hair. There are 5 levels of heat available. There’s 300 F for damaged hair, 340 F for thin hair, 370 F for normal hair, 410 F for thick hair, and 430 F for very thick hair. The straightener comes with a bottle to fill the water tank. The steam aspect will give you even more heat to tackle your hair. It adds moisture to tame your hair and add shine. Your hair will be glossy and have body instead of falling flat. Magicfly sends accessories with their steam iron. You’ll get a glove to ensure you don’t burn yourself. There’s a comb and clips for easy sectioning of your hair. The bottle to fill the water tank in included, too. You can use that water bottle to inject hair product into the tank. They advise against using oil because it’ll clog the inner workings. Other products can be added, though. There is a steam setting that gives you options for straightening. The steam can be turned off completely. It could be turned to medium or high depending on your hair needs. When using, you’ll have to turn the steam on since it’s set in the off position. The accessories are incredibly thoughtful. With the comb and clips, you don’t have to buy them yourself. Those things constantly get lost, so it’s good to have them sent with the iron. The glove is fantastic, too. It’ll keep you from getting burned with the rising steam. As far as heat for natural hair, the steam iron has a few settings that address natural hair concerns. The high heat and high steam work together to create a glossy look that is moisturized. The last thing women want is dry, straight hair that doesn’t move. The steam iron has worldwide voltage, too. You’ll be able to use this anywhere in the world. When you’re on vacation, there’s no worry about what the water or humidity might do to your hair. Stash that iron on your luggage, and you’re good. The tank has to be situated properly or it can leak. The manual instructions have to be followed carefully. This steam straightener has plenty of heat adjustments. So, you’ll get the right heat each time you flat iron your hair. It heats up fast and glides gently over your natural hair. The LED digital screen will display the exact temp you’re using. It ranges from 265 F to 450 F by 5 degrees. For example, you’ll go from 265 F to 270 F to 275 F, etc. A water tank is embedded in the handle of the straightener. You’ll add water and non-oil hair serums to the tank. The steam will mist your hair as it’s straightened. The plates are ceramic, so they’ll heat pretty fast, too. You get a longer-lasting style with plates combined with steam. The steam won’t start until you’ve reached your desired temperature. That way you’re not wasting the water when it’s not quite ready for straightening. You can also leave the steam option off if you like. There are times when you might want to give your hair a quick touchup without steam. 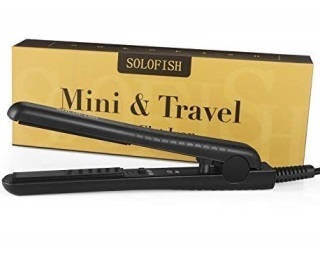 Travel with this steam flat iron is simple. The flat iron is sleek and trim. It’ll fit in a small space in your luggage. You don’t have to worry about sun, water, or humidity while on vacation. The dual voltage design will automatically adjust itself to the voltage anywhere you are in the world. The precise temperature settings are fantastic. Changing it by degrees of 5 means that you can dial in the exact heat you need. You can experiment to find the exact temp you need for your natural hair. It might be a different temperature based on whether you have color in your hair, too. Turning the steam on and off gives you an extra layer of flexibility, too. You’ll be able to do quick touchups to keep your style going longer. The quick heat option helps you do that as well. In 15 seconds, you’ll get a high enough temp to press out slight curls or waves. For those who travel a lot, the worldwide voltage option is a great feature. You’ll be able to take this flat iron anywhere in the world. You don’t have to give you your style while you’re on vacation. There’s no automatic shutoff for this flat iron. You’ll have to be diligent about shutting it off yourself. The features of the Infiniti Pro include nano silver tourmaline ceramic plates. It produces negative ions that will create soft, silky hair. 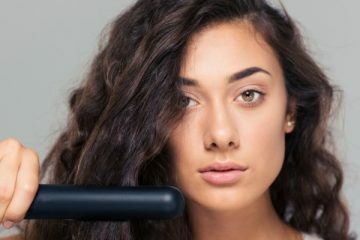 Your natural hair will feel better than it ever has after using a straightener. Healthy moisture is sealed into each hair strand. An LED screen displays the 5 available heat settings. The heat will go all the way to 455 F. It also has the ability to heat very quickly. In 30 seconds, you could be ready to touchup your hair. The quick temp setting will go to 395 F.
Additional features include the retractable combs. It helps to detangle your hair while it’s passing through the plates. It removes the need to comb through it yourself while using the steam flat iron. The combs can vary in height depending on what you need. They can also be removed. The steam flat iron comes with a professional pouch. The pouch is great for storing your device. You don’t want it open to the elements where dust can settle on the plates. The pouch also turns into a heat-resistant mat to rest the straightener. It’ll protect your counters from heat and scorch marks. The retractable combs can be locked into three different heights. You can remove them completely, keep them low on the plates. Or you can raise them. It’ll depend on how tangled your hair is. If you just want it to guide your hair, low is perfectly suitable. 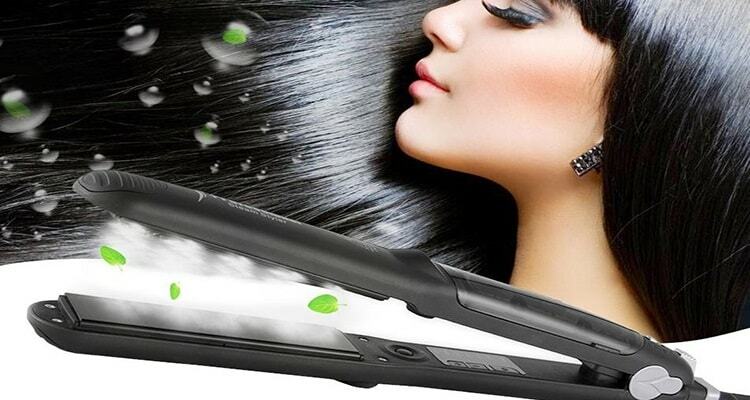 The safety features and bonuses are important in a steam flat iron. It’s easy to burn yourself when dealing with high temperatures. Especially with steam and hot metal plates. The device has an automatic shutoff after 60 minutes. It also comes with a mat that serves as a heat-resistant mat for resting the flat iron. 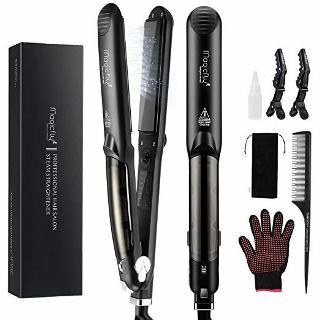 There’s a lot of versatility and choices with this straightener. You’re able to choose the steam level, the height of the combs, and the temp setting. You could turn off the steam and remove the combs to have a regular straightener if you wanted. The straightener requires distilled water. It’s to ensure there are no minerals that can clog the steam system. 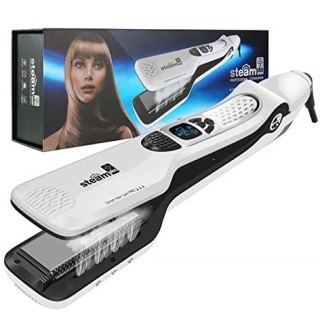 This steam hair straightener from MKBOO has a large capacity tank. While styling your hair, you won’t have to stop and refill the device. It takes clean water and any hair products that don’t have an oily residue. For your natural hair, you can add products directly to the tank to get every strand. There’s an LED screen for displaying heat and whether the steam is working. You can lock in the temperature for the device. It’s displayed on the screen, too. The heat ranges from 300 F for fragile hair to 450 F for resistant hair. Your natural hair will be somewhere in between. Unless your hair is resistant to most styling products and devices. In that case, you would want the high 450 F setting. After 300 F, there’s 340 F for thin hair, 375 F for normal/average hair, 410 for coarse hair, and 450 F for resistant hair as mentioned before. The device has removable teeth. The comb does a few things for you. It’ll keep your hair from tangling as it goes through the plates. The combs spread the hair out, so that all your strands will get even heat. The best part of this straightener is the huge water tank. With 40ml, you won’t have to stop your styling. It can be a bit of a pain to run out of steam before you’re finished. It’s unlikely to happen with the generous tank that’s included. It’s the little things that make a difference with this straightener. There’s a comb to free up your hands. You don’t have to use a brush or comb while straightening. That leaves your hand free to clamp the device tight on your hair. Another great part of the device is the auto temperature lock. Once you’ve gotten the device to your perfect temp, it’ll stay locked on that temperature. You’ll be able to see a lock icon on the display. This device is a bit on the heavier side, but that’s likely due to the generous water tank. 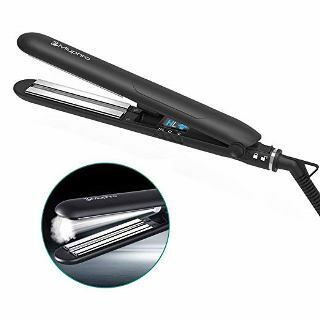 This steam hair straightener has a long titanium heat plate. It will evenly conduct heat across its surface. It’s also a 3D floating plate. It will always touch your hair as it’s gliding down each section. It protects against pulling and tugging. Titanium is more durable, too. That’s important when you’re adding water to your styling. There are 2 heat settings. You have the 350 F temp for hair that’s more fragile. It’s good for dyed or fine hair. When you need gentle heat, this is the right temperature. For resistant hair and some natural hair consistencies, you’ll want the 410 F. It’s for resistant hair that’s difficult to style. The time-saver option gives you heat within 60 seconds. In that time, you can section your hair. The steam flat iron will be ready to get to work. The steam part of the device works with ultrasonic technology. It decomposes water instead of vaporizing it. That process infuses more moisture into your hair shaft. Important safety features like a locking button and automatic shutoff are included with this iron. The locking button shuts the plates tight until you’re ready to use them. That’s a safety concern as well as good for storage. The device will automatically shut off after 60 minutes. The slim, titanium-plated device was easy to use. It’s lightweight and won’t feel like you’re holding a brick over time. It has a safety button for locking the plates closed. That’s good if you have children around or want to free up room to store it. The titanium is great for conducting heat. It won’t snag your hair like some other materials. For coarse hair, titanium is a good option. This gets up to a respectable 450 degrees, too. In this device, you’ll find that it uses ultrasonic technology. That produces steam without heat. It’ll infuse your hair with moisture with none of the heat. Damage to your hair is minimized when you don’t overdo high temperatures. That’s an important aspect to this flat iron – especially for natural hair. The tank is on the small side. It takes a few fill-ups to get through an entire head of hair. The amount of water in the tank will relate to the styling time. A high-capacity water tank will work for longer than a small one. You’ll want to consider this when making your purchase. Your styling time will vary depending on the amount of water. You might spend 20 minutes straightening your hair with a regular iron. It might only take you 10 to 15 with a steam iron. The steam helps to speed up the process while still delivering soft, healthy hair. A steam flat iron still needs to have temperature settings. Your natural hair might not need high heat. Hair that’s been processed or treated with color needs a lower temp. You can choose your heat settings based on your hair type. It’s not always about having the highest heat possible. It’s based on the degree of curl and also the health of your hair. You don’t want to add extreme temps to your fragile strands. There are some people who comb their hair while straightening. It’s done at professional salons. If you use a comb in a “chase” method of straightening, you’ll want a comb with your steam iron. It relieves you of having to use a comb and two hands for styling. Those who have never used a comb to style can try out this method. There are some steam flat irons with combs and without. You can choose one that has a detachable comb, too. It will give you plenty of options for styling. Like a regular flat iron, the plate materials matter. For your natural hair, you’ll want a material that won’t snag your hair. Hair that’s easy to straighten can benefit from the ceramic. Steam releases negative ions, but you can also use tourmaline. Titanium will last longer and can be used with hair that’s a bit resistant and stubborn. Safety features like the automatic shutoff are great for styling. It’s distracting and scary to have a panic attack in your meeting because you’re not sure if you left the flat iron on. With the auto shutoff feature, that will never be a concern. You can easily run out the door and never worry about the flat iron burning down your house. Stationary plates won’t flex and move with your hair. That’s not great because you’ll end up with sections that aren’t straightened. The plates should move and float with the thickness of your hair across the entire plate. That’s really important when using steam for your natural hair. You don’t want to keep applying heat and steam to hair strands. It can cause serious damage if you repeatedly attack the same section over and over. The steam flat iron uses vapor infusion to inject moisture into your hair. Regular flat irons use hair’s own moisture. This can leave hair feeling very dry and brittle over time. You reduce that by using products that protect the hair. But with vapor infusion, you can use less product on your hair due to the injection of moisture. The steam flat iron’s heat won’t damage the hair strands. The hydration that infuses your hair with moisture prevents damage from high temperatures. You’ve likely stayed natural with your hair to avoid using tons of products. With less heat damage, you don’t have to use products that are made to protect hair from heat. That will save you money as well as time during your styling process. With natural hair, you want to create a sleek, silky style. Without chemicals, that can be hard to do. Often, the addition of chemicals or product can weigh your hair down. It’ll be heavy and won’t move as much as hair without chemicals. When straightening with steam, you’re getting a smooth, soft finish. It allows your hair to move beautifully without being stiff. You want straight hair, but you don’t want stiff hair that doesn’t move. The frizz that normally happens to hair after straightening is due to dryness. That won’t be a concern with a steam iron since moisture is a huge component of the process. It creates a soft head of hair that’s very shiny. Frizz is dry and dull, which won’t happen with straighteners using steam. A steam flat iron is gentle on your hair and won’t pull or break it. That’s a huge relief for those who are worried that they could damage their natural hair. The silky straight hair should last for more than one day. Hair shouldn’t be washed every day, either. It keeps your hair healthier when you’re not regularly stripping it of essential natural oils. You don’t want to go to bed, wake up, and have to straighten again. A few touch ups might be required depending on how you sleep. But you shouldn’t have to redo your entire head. 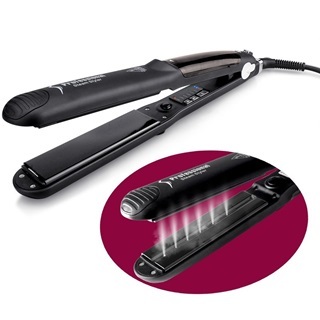 The steam flat iron infuses moisture and heats deep through the hair strand. The results will last longer than other flat irons. The beauty of the steam iron is that you can add essential hair oils to the water. In the water tank, you can add a few drops of your favorite essential oils for a fresh smell. Or you can add Argan oil for smoother hair. The heat of the steam and vapor will infuse every strand with the oils. When you are using your hands to deliver the product to your hair, you’re not getting every single strand. That’s changed with the use of the vapor infusion system. After reading these reviews, you can see that it takes some care. But there are plenty of good steam irons for natural hair. All you need to do is get the right oils for moisturizing. It’s tempting to leave the straightening to a professional, but that can be expensive. With the right steam flat iron, you’re going to save money in the long run. You’re also in complete control of the temperature and style. With you in control, there won’t be a terrible mistake that really damages your hair. Casy Flintof is the chief editor of Getarazor. I can swim and run a lot. I’m a hairy guy who likes to shave regularly. 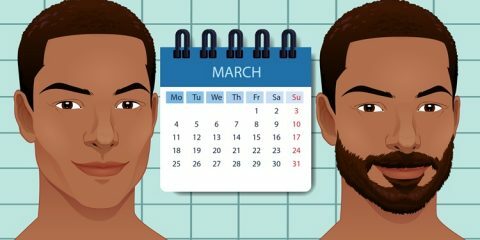 My aim with this site is to help you get the best shaving products.